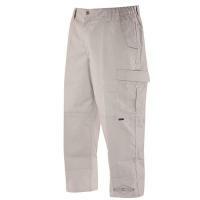 Tru-Spec's 24-7 Series tactical cargo pants are built to take a beating without losing functionality. The impressive polyester/cotton rip-stop fabric resists tearing and abrasions, and the seams are felled for additional durability. The pants feature a traditional, tailored cut, but the elastic waistband and gusseted crotch ensure a full range of motion that accommodates a range of activity--from running, climbing and fighting. The two deep front pockets include reinforced bottoms, allowing them to safely carry a tactical knife. The large cargo pockets have covered flaps secured by bar tacks for protection, and behind each one is an accessory pocket sized to fit most smartphones. Available in Tru-Spec's Big & Tall sizes, up to 60" waist.